There are world events, for which it is difficult not to hear and even harder to not follow their course, as shed light on the problems with which humanity fights. Conference in Davos is a place where they meet representatives of major economic organizations, the most influential political organizations and intellectuals, who together discuss the major social and economic problems of the planet. World Economic Forum presented the annual report – prepared by 700 world experts. The document says that reflect social inequalities in income and the lack of jobs for young people are the factors that probably the greatest – to take a toll on the global economy in the coming decade. Prepared the report warns that the risk posed by deepening social inequalities, despite signs of recovery of the global economy. Lost generation of people who enter adult life in the early twenty-first century, could lead to the outbreak of social unrest, as it awaits a very bad situation in the labor market. Global Political Economy refers to those approaches to analysing world society which seek to overcome the disciplinary divisions of social science (Van der Pijl K., 2009). 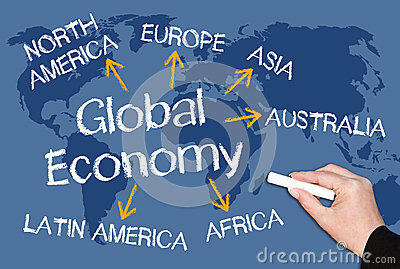 Globalization represents a new, transnational phase in the development of the world capitalist system. A Defining feature of the globalization epoch is the rise of transnational capital (Robinson W., 2004). Nevertheless, in many countries, public finances is so bad that the next few years should be expected budget cuts there, which is not conducive to the creation of jobs. Time to realize what will be the main effect of the financial crisis in developed countries? Most, of course, young people will suffer because the market will be even less jobs. The process of globalization in its positive dimension had to contribute to increase the global reach and open the borders, not only transnational, but mostly mental. The world economy has evolved into a global basis. Do covering the whole world and changing the global economy is the key to prosperity? Robinson wrote: I argue that in the new, transnational phase of the capitalist system we are moving from a world economy to a global economy (Robinson W., 2004). The biggest problems that await us in the capitalist world is a fiscal crisis that may occur in key economies around the world. The next are the high rate of general unemployment, large disparities in income, food crisis, deep political and social instability. Perhaps the solution to the problem would be to use the Constructive approach which pay more attention how governments, states and other actors construct their preferences, highlighting the role of identifies, beliefs, traditions, and values (Woods N., 2011). The global economy is undoubtedly a great opportunity to improve economic situation on the world, because so much easier and more efficient to work together than separately. Risks will always appear, but the key is the use of appropriate tools which the process of globalization has allowed man to develop in our capitalist world. William I. Robinson (2004). Globalisation as Epochal Change in World Capitalism in: A Theory of Global Capitalism: Production, Class and State in a Transnational World, Johns Hopkins University Press, pp. 1-32. Van der Pijl K. (2009) From Classical to Global Political Economy: A Survey of Global Political Economy [online]. University of Sussex: Centre for Global Political Economy. Available at: http://www.sussex.ac.uk/ir/documents/091theories.pdf. [Accessed 16 October 2014]. Woods N., (2011). International political economy in an age of globalization in: The Globalization of World Politics, Oxford Univeristy Press, pp. 248-260. Global Risks 2014, World Economic Forum, Available at: http://www3.weforum.org/docs/WEF_GlobalRisks_Report_2014.pdf [Accessed 26 November 2014].